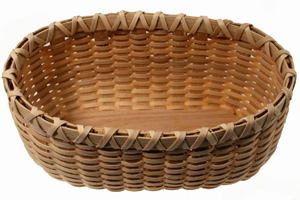 Bread Basket kit uses a 3 x 7 3/4" racetrack slotted base. A very easy to weave design with beautiful results every time. Basket measures 5" x 9 3/4" x 4 1/4" tall. Another Sunday Best basket. SKILLS LEARNED: weaving with slotted bases, plain weave, & rim lashing are learned with Bread Basket Kit. I made 11 of these baskets to give to my Book Club members for the Christmas gift exchange. Everyone was impressed and loved them. They were easy and quick to make. I added some color to several, and used alternating smoked and natural reed on a few others.